My kit supplies are dwindling. And I’m down to bits and pieces. When I first saw this Echo Park fan paper in the class kit I knew there would be a die cut fan in my future. I used my Silhouette to cut the fan to fit my page. And I used the Just Ducky font for my letters. I even got a little crazy and tried out my new Jenni Bowlin Chicken Feed paint dabber on my background paper to add a bit more color. Using some scraps and some stitching I completed my last page. 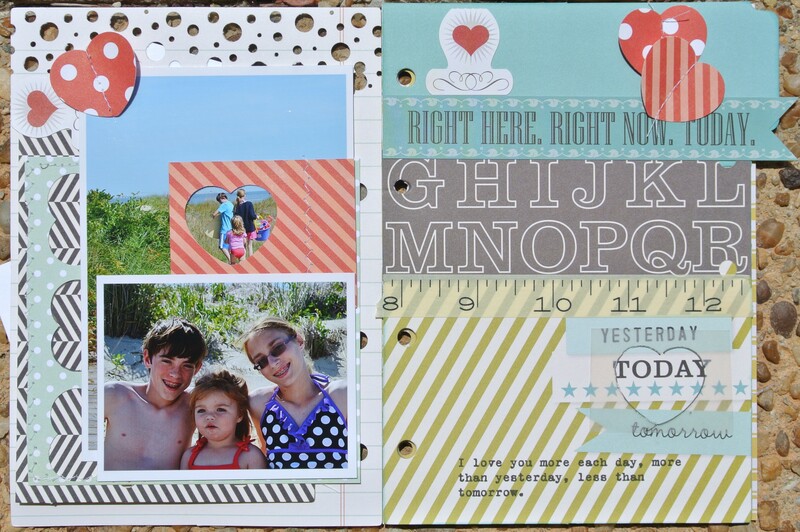 With these last pages I have finished Studio Calico’s Get Messy class taught by Celine Navarro. I have tried several techniques that I never would have if I hadn’t enrolled. So Yay! The only technique I did not get to is her laser picture transfer, but I promise I will be trying this in the future. And as soon as I figure out how to make laser copies of my pictures. And I have finished just in time as My Pieces of Me class with Maggie Holmes started Friday and my Washi Workshop starts Monday. Eeeek!